In December 2015, Canada made a commitment to reduce our CO2 emissions (all emissions within our borders) 30% below the 2005 level by 2030. The target is 517 million tonnes (Mt) of CO2eq. Based on the currently expected path of economic growth in Canada – and taking into account all existing policies to curb emissions in place by September 2017 – total emissions in Canada are projected to continue rising over the next fourteen years, up to 722 Mt by 2030. If we approach the problem in terms of how we can most effectively reduce the total amount of carbon accumulating in the atmosphere, our task (from the perspective of our own country’s contribution to a global solution) is to decide where in the Canadian economy we can most efficiently – and with the least disruption to people’s livelihoods – achieve substantial emissions cuts, which will have to be incremental and not too sudden, but sustained over a long period of years. The Federal Government divides Canada into seven economic sectors. The five largest sources of emissions are the oil and gas sector, transportation, buildings (heating and air conditioning), electricity generation, and heavy industry, in that order. Oil and gas activities account for 26% of Canada’s total annual emissions. They also contribute the largest share of annual emissions growth, which is currently projected to continue rising until 2030. The expansion of oil sands production is the largest single source of that growth. The current forecast is that oil sands production will nearly double from the 2014 level of 2.3 million bpd to 4.5 million bpd by 2040. Transportation emissions make up 24% of the national total. Over the past ten years, the annual level of transportation emissions – all of our passenger cars and freight trucks, all rail transport, domestic aviation, and marine shipping – has not declined at all. 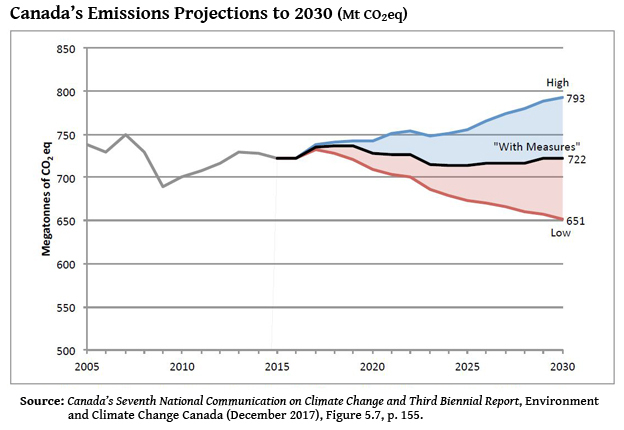 Canada’s Seventh National Communication on Climate Change and Third Biennial Report (December 29, 2017) tells us that, based on current policies, by 2030 total transportation emissions are expected to decline by only about 5% below the 2005 level, a minuscule cut over twenty-five years. A look at just those two large parts of the Canadian economy, which together comprise about 50% of Canada’s total emissions, explains a lot about why current projections to 2030 show no absolute reduction below the 2015 level. To begin, the focus of this site is the oil and gas sector, and specifically the implications of expanding oil sands production between now and 2030 – because, based on the Government of Canada’s own data, the oil sands will be by far the largest source of emissions growth over the next fourteen years. Can we achieve a 30% cut in Canada’s total emissions by 2030, down to 517 Mt, if emissions from oil sands production keep rising? Can we get enough reductions from the other sectors?